Following the incredible reception of Big Finish’s adaptation of ‘Love and War’ from The New Adventures novel range to mark the twentieth anniversary of the character of Bernice Summerfield with, fittingly, her introductory story, a new range of novel adaptations is now underway to highlight more of the written but previously unheard stories of the Doctor. 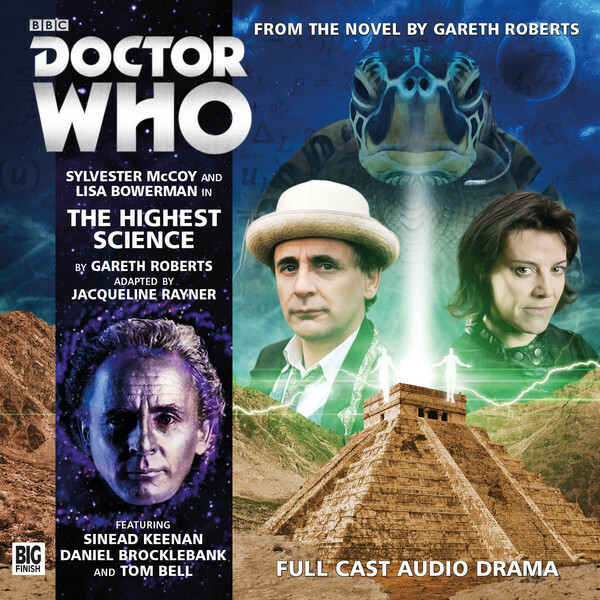 ‘The Highest Science’ novel marked the prolific Gareth Roberts’s first official tale in Doctor Who canon, and it captures the traditional essence of The New Adventures era perfectly. As the Seventh Doctor pursues a Fortean Flicker and the very heart of coincidence, Bernice and he land upon the planet Sakkrat, a legendary world once home to an advanced race that created the pinnacle of technology in The Highest Science before falling into oblivion. Of course, the two soon find themselves caught in much grander events than an isolated quest for this mythical technology as the notorious criminal Sheldukher mysteriously appears after centuries of travel with his telepathic brain being known as The Cell to find The Highest Science for himself. With the planet’s surface also littered with members of the militaristic if straightforward Chelonian race continuing their quest to eliminate any parasites in their way, in this case a displaced group of twentieth-century humans, the lives of individuals and of the entire cosmos hang in the balance. With so many plotlines to juggle, ‘The Highest Science’ in both of its formats does sometimes lose a sense of cohesiveness. In particular, the storyline regarding the Chelonians and the humans known as the 812s has little overall bearing on the greater narrative at hand regarding the search for the titular technology, and this carries through to the resolution where the Doctor simply freezes both sides in a slow-time field, promising to return at a later time if he finds a better solution. Fortunately, the actual quest is incredibly engaging as scraps of knowledge are assembled to find its likely location, and the fact that the entire complex is actually a trap for Sheldukher in order to recover the stolen Cell is fascinatingly complex. While the Doctor here may not be the almighty chess master of some stories, he still has a good suspicion about what is going on as he cautiously guides events, and it’s intriguing to see how much faith he places in Benny so early on in their adventures together. As will undoubtedly be a staple for these novel adaptations due to time constraints, the number of characters from the source material has been reduced to facilitate pacing and progression, though the afore-mentioned human storyline does suffer a bit here as a result. The Chelonians aren’t necessarily meant to be the most fearsome of races as they bring a more light-hearted edge to their militaristic and honourable menace, but they certainly make for an intriguing threat even in this rather limited capacity. Daniel Brocklebank gives a strong performance as Sheldukher as well, though his portrayal does sometimes verge into more over-the-top megalomania than how the character seems to have been originally written. With Sylvester McCoy and Lisa Bowerman again on top form even if their Doctor-companion relationship is understandably not as measured and nuanced as that of the Doctor and Ace, ‘The Highest Science’ remains faithful to its source material while offering another strong production that captures the essence of the written era wonderfully, both in terms of strengths and weaknesses.